Gill and Helm van Zijl visited the Kalahari and Namibia during June and July 2013 and recorded over 50 Sociable Weaver colonies. Of interest is that part of their trip covers the study area of Gordon Maclean. Gordon studied the Sociable Weaver in the southern part of the now Kgalagadi Transfrontier Park for his PhD (completed 1967). 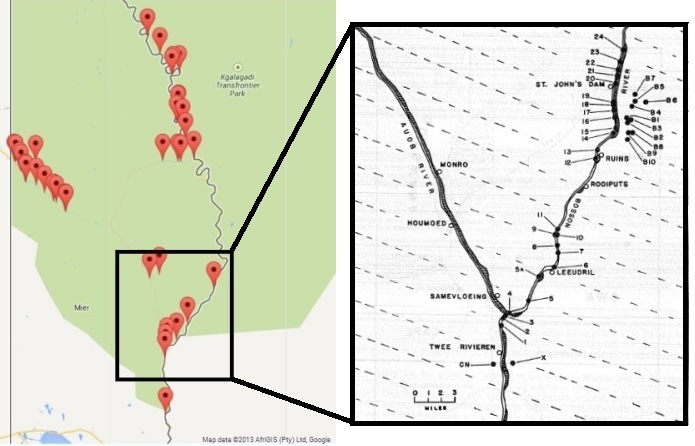 Helm and Gill submitted some records (map - left) from the area that Gordon had as his study area in the southern Kgalagadi and along the Nossob River (map - right). Gordon studied 24 colonies along the river, and 10 colonies in Botswana, and 2 colonies near Twee Rivieren (colonies indicated by numbers on his map). Gill and Helm looked for all the nests they could find, but did take one detour where they would have missed the bulk of Gordon's colonies. Gill and Helm will be back to survey Gordon's colonies from 46 years ago, but anyone else visiting the area can also conduct a comparative survey! Helm and Gill also noticed that there was no evidence of any of the Southern Masked Weaver nests that they had recorded in February 2012 whilst in the Kalahari. This was the area along the upper dune road that connects Urikaruus to Dikbaardskolk and also the Nossob valley where one particular tree that had about 60 nests in 2012 and now there was no trace of even a shred of grass hanging. See all Helm and Gill's PHOWN records here.